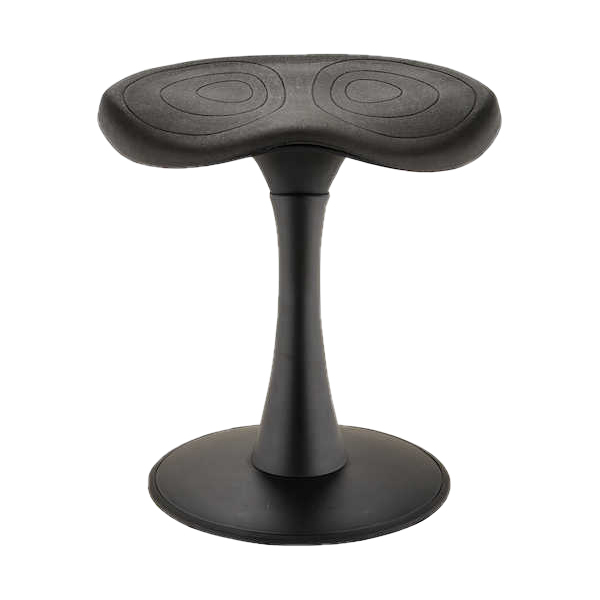 The Focal Fidget Active Stool from Safco Products is a lightweight portable stool that encourages users to actively engage in subtle movements while still remaining seated. The Fidget features a slightly curved bottom plate that enables continuous rocking movements in all directions. The contoured EVA Foam seat cushion provides a comfortable seating experience, whether for just a couple of minutes or for more extended periods. The base is constructed of ABS Plastic and reinforced Nylon with a steel support column capable of supporting up to 300 lbs. 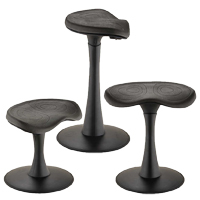 The Fidget Active Stool comes in 3 heights to serve the seating requirements of a wide range of people. The 18" and 22" models will serve most adults for sitting at a traditional office desk or table height, while the 14" model is better suited to the needs of children sitting at a lower height of table or desk. 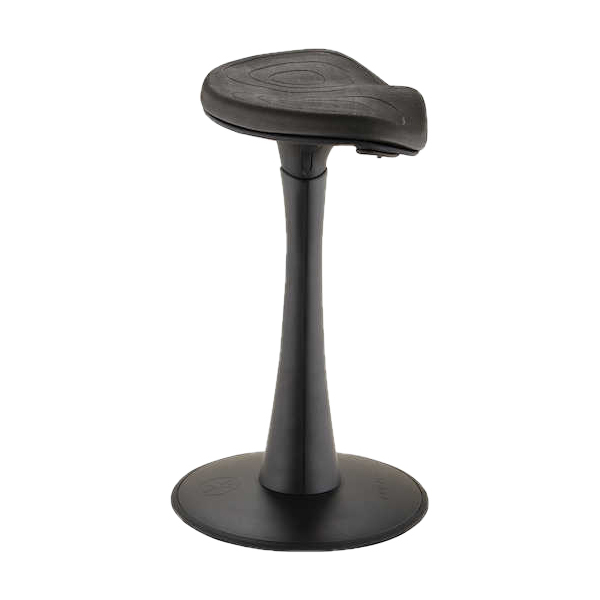 Note: The Fidget Active Stool is not designed or intended as a long-term seating solution and as such should not be considered for this application. There are numerous other traditional and alternative seating solutions much better suited for long-term sitting. 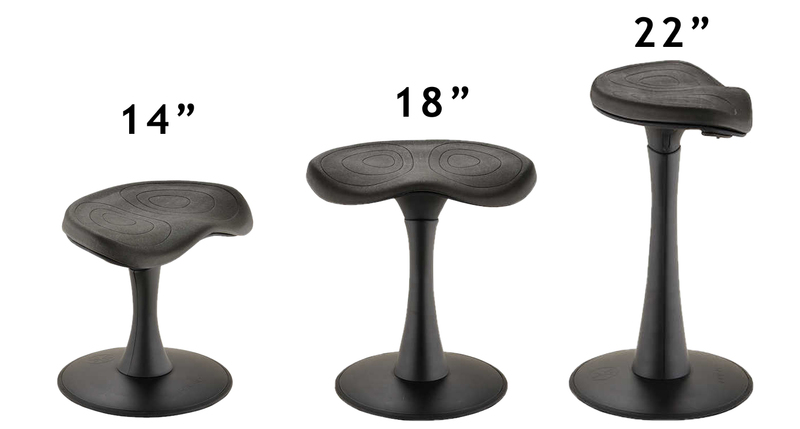 Reduces Weight Load on Legs and Feet - Because of its more "stool or chair-like" design users tend to use the Focal Fidget Active Stool at a lower height than other seats which are more better suited to the leaning posture, such as the Pivot or Mobis Seats. The result is that a higher percentage of weight is transferred to the Fidget. With the Fidget bearing the primary weight load the pressure on the joints of the lower limbs is greatly reduced. This translates into reduced risk of damage to the knee and hip joints (which can occur when these joints remain under continuous strain from standing on hard surfaces). "Active Working" Dynamic - The base of the Fidget is slightly curved to encourage a greater degree of movement while seated. Users looking for "free movement" and more of a "leaning stance" should consider other options such as the Pivot or Mobis seats which offer a much greater degree of freedom in achieving this movement. The ability to move or rock the Fidget can encourage users to actively move their body throughout the day. This movement can benefit the entire body as it will exercise core muscles in addition to the muscles of the legs. Flexing of the muscles of the legs is difficult when in a traditional standing position and can lead to swelling of the lower legs (edema) as blood and fluid collects in them. Relaxed activation of those muscles is encouraged by the Fidget Stool as the muscles are employed to shift or rock the seat throughout the day. As well, because the Fidget carries the primary weight load these muscles are not held in constant tension but can be easily flexed, even when not rocking. Although minimal, this minor flexing aids in moving fluids back into the circulatory system. Can Aid in Maintaining Mental Focus - Persons who have difficult sitting still may benefit from the freedom to engagement in movement that is offered by the Fidget Active Stool. Because they can engage in subtle movements they will be able to release what would otherwise be distracting pent-up energy. Reduces Fatigue - Many people who have adopted the concept of Standing to Work have discovered that standing all day is actually tiring, especially on the feet and legs. For those who are pursuing a more healthy and active lifestyle, standing while working can actually reduce their ability to achieve this goal. The reason is that by the end of the day some may find that their legs and feet are already exhausted and require a rest. As a result, rather than having energy to pursue their recreational activities at the end of the day, those people find themselves seeking respite from activity. By taking regular breaks throughout the day and resting on a Fidget in a more traditional seated posture, while still retaining a degree of movement, they will be able to end their day without the fatigue that continuous standing will generate. Expands Comfort Zone - The potential tilting range of the Fidget lets users reach further onto a desk surface than would be possible from a traditional "fixed" seat. This means that their comfort zone while seated remains similar to what they would have while standing, providing access to a larger area of the worksurface while at the same time reducing the risk of overextension. 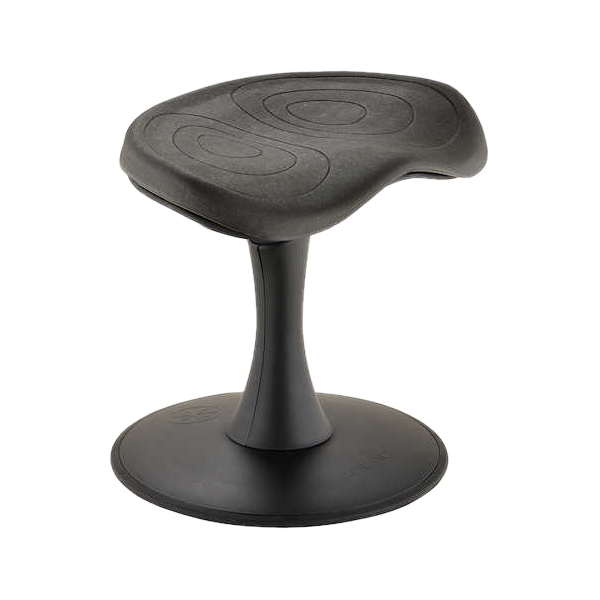 Active Seating Base: The base of the Fidget Active Stool has a curved base that permits users to freely tilt the seat. By shifting their weight in different directions users are able to generate a degree of rocking motion. Because the curve is limited the Fidget still offers excellent stability, even while permitting the freedom of movement. Comfortable: The contoured EVA Foam seat cushion reduces the risk of pressure points against the back of the thighs and offers a "natural" contour for sitting. Portable: The Fidget is lightweight. The 14" model weighs just 5.5 pounds, the 18" model only slightly more at 5.75, and the 22" model is still only 6 lbs. As such these seats are easily picked up and moved at will. Storable: All models of the Fidget Active Stool can easily be stored out of the way when desired, even just tucked under the desk. Sturdy Construction: The Fidget is rated to support up to 300 lbs (136 kg). Don't expect the Fidget to provide freely rocking movement. The design of the Fidget is geared more to smaller subtle movements and does require a more active participation of the user to accomplish this. If a free and "instinctive" movement is desired you may wish to consider a Pivot or Mobis seat as an alternative. Avoid using the Fidget Active Stool for extended sitting. This posture tilts the pelvis backwards and exerts high levels of stress on the lower lumbar region. This is compounded by the absence of a backrest which could possibly offset some of this stress by providing support to the lumbar region.